A recent article by John Broder in the New York Times about Tesla’s new Model S sedan drove a great deal of controversy about whether the journalist told the truth in his review of the electric car. Elon Musk responded yesterday, aiming to refute what the journalist said. However, the Tesla data purported to prove a series of lies raises some questions of its own. Let’s take a look. Perhaps the most interesting data, in this respect, is the graph showing predicted range vs actual miles driven. Now, all becomes clear. 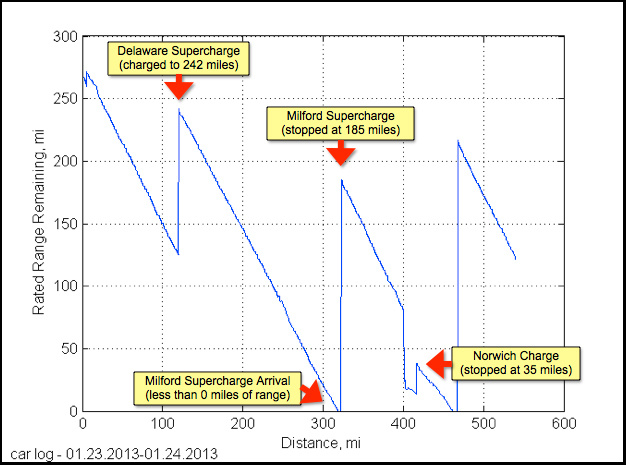 In nearly every case, the Tesla gets about 20% fewer miles out of each charge than it estimated. 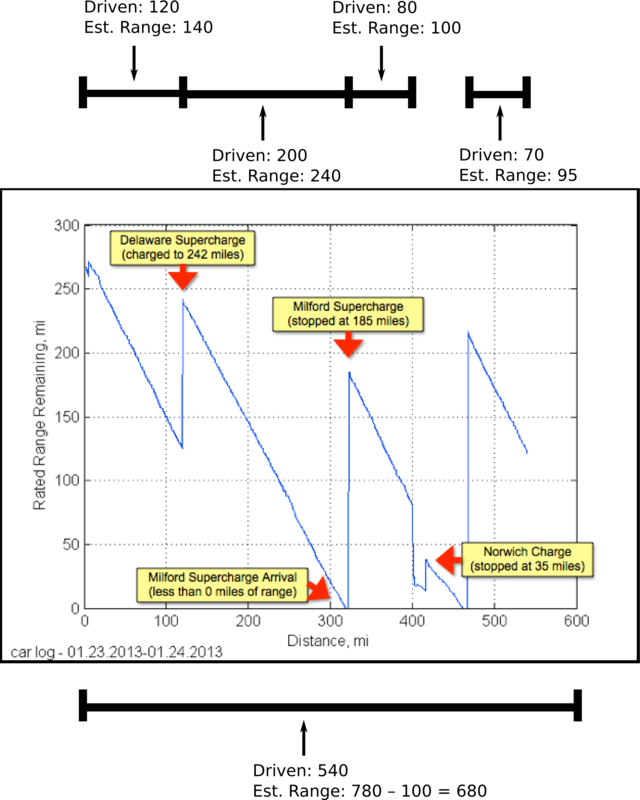 Throughout the entire drive of ~540 miles, the estimated range based on combining all charges, then subtracting the remaining charge (scaled down by 20%, consistent with each subsection of the drive), we see a global loss of ~20% in achieved mileage vs estimated range. In other words, if you’re driving the Model S and not watching the estimate closely throughout the entirety of a longer drive, the initial mileage estimate could fall well short of your goal. About 20%, at least for this data and this driver. 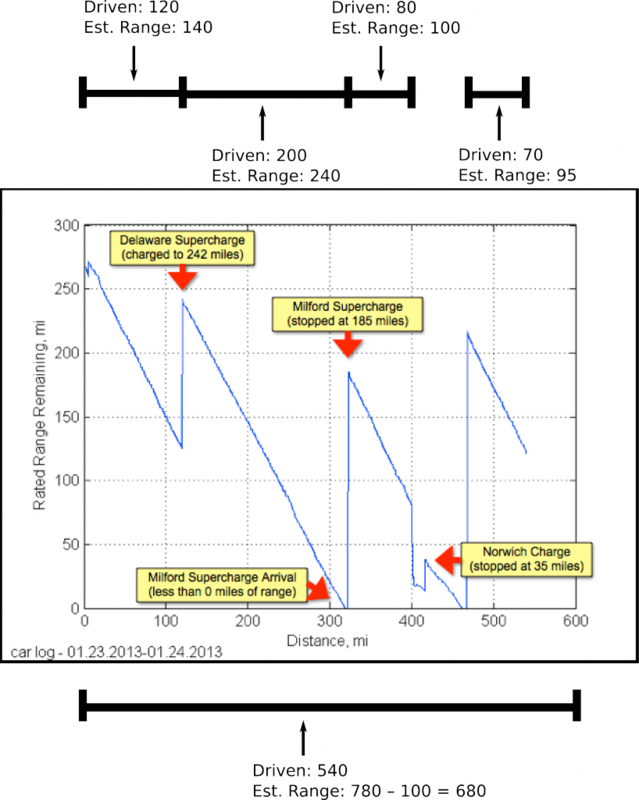 So regardless of any disputes over Broder’s driving speed, it seems reasonable to conclude that he could have fallen somewhat short of his goal if he only looked at the charge when beginning each segment of the trip. Update: The Atlantic Wire also posted a worthwhile consideration of Elon Musk’s blog. Read the comments too. Disclosure: Tesla Motors is not a client.